Researchers developed a faster strain-temperature sensor that features 1 million sensing points over a single 10-kilometer of standard fiber. It could be useful for monitoring the integrity of large structures and for biomedical sensing. Credit: This work is a derivative from Vasco da Gama Bridge by Duncan Rawlinson used under CC BY-NC 2.0 and licensed by Alejandro Dominguez-Lopez, University of Alcala, under CC BY-NC 2.0. "With fiber-based sensors, it is possible to precisely detect erosion or cracking before a dam fails, for example," said Alejandro Dominguez-Lopez from the University of Alcala (UAH) in Spain, from the r research team that developed the new sensor. "Earlier detection of a problem means it might be possible to prevent it from getting worse or could provide more time for evacuation." The new sensor is about 4.5 times faster than previously reported sensors with 1 million sensing points. Although there isn't a magic number, more sensing points means fewer fiber-optic units are needed to monitor an entire structure. This simplifies the overall sensing scheme and could potentially reduce costs. "Because we have such a large density of sensing points—one per centimeter—our optimized sensor could also be used for monitoring in applications such as avionics and aerospace, where it's important to know what is happening in every inch of a plane wing, for example," said Dominguez-Lopez. The new sensor uses an approach known as Brillouin optical time domain analysis, which requires pulsed and continuous wave laser signals to interact. The researchers discovered that the traditional method of generating the continuous signal caused distortions in the system at higher laser powers. These problems could be avoided by changing the way that laser signal was generated, allowing them to increase the laser power and hence improve the sensing performance. "The detrimental effects that we studied and corrected have been affecting the performance of commercially-available Brillouin optical time domain sensors for some time," said Dominguez-Lopez. "If manufacturers incorporate our optimization into their sensors, it could improve performance, particularly in terms of acquisition speed." Using the new approach, the researchers demonstrated that they could measure the temperature of a hot spot to within 3 degrees Celsius from the end of a 10-kilometer long fiber. The researchers are now working to make the sensor even faster by looking for ways to further reduce the acquisition time. They also want to increase the density of sensing points to more than one per centimeter, which could allow the technology to expand into completely new areas such as biomedical applications. The optical fibers could also potentially be adapted for use in textiles, where the sensors could help to monitor a person's health or screen for disease. For example, the researchers think it might possible to use the fiber optic sensors to detect temperature deviations that are present in breast cancer. For this type of application, more sensing points in a smaller area would be more important than using a particularly long fiber. "In our paper, we not only identified a major limitation of this sensing technique but also demonstrated a way to overcome that constraint," said Dominguez-Lopez. 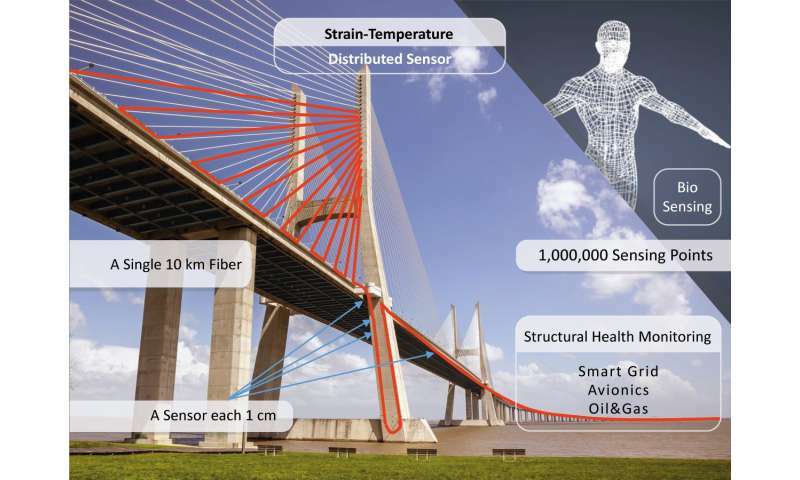 "The new sensor could enable improved structural monitoring and help move this sensing technology into exciting new research areas and applications."